This year’s speaker, Garry Hesser, is the first Augsburg professor selected to be the Torstenson lecturer, and Hesser will present “Place Matters…So?” at 5 p.m., April 2 in Hoversten Chapel, Foss Center. Hesser’s lecture will focus on concepts with a clear connection to the legacy of the event’s namesake. The annual lecture acknowledges the contributions Augsburg professor emeritus Joel S. Torstenson ’38 made to the College by founding the Sociology Department in the late 1940s; laying the foundation for the Metro-Urban Studies and Social Work programs as well as the Higher Education Consortium for Urban Affairs; expanding experiential education; and uplifting Augsburg’s identity as “a college in the city,” according to Nancy Fischer, associate professor of sociology and presentation coordinator. Augsburg College educates students to be informed citizens, thoughtful stewards, critical thinkers, and responsible leaders, and—as acknowledged in the institutional mission—the College is shaped by its urban and global settings. “Joel Torstenson shaped that part of the College mission, and Garry became the bearer of that torch when Joel retired,” Fischer said. In 2012, the National Society for Experiential Education (NSEE) presented President Paul C. Pribbenow with the William M. Burke Presidential Award for Excellence in Experiential Education. Pribbenow, in an acceptance speech delivered on his behalf, said the award was possible because of the work of Hesser and others who have dedicated themselves to the experiential learning that is at the heart of the identity and character of the College. Hesser is the Martin Olav Sabo Professor of Citizenship and Learning and professor of sociology and metro-urban studies. He chaired the Augsburg Natural and Social Sciences Division from 1996 to 2006 and chaired the Augsburg Metro-Urban Studies program for more than 30 years. Hesser will retire at the conclusion of the 2012-13 academic year, and the Torstenson event will include a celebration of Hesser’s career immediately following the lecture (schedule below). 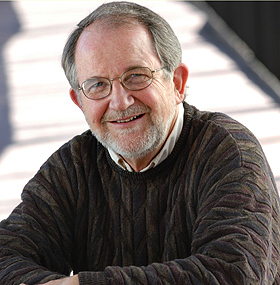 Hesser is the author of Experiential Education as a Liberating Art; “Principles of Good Practice in Service-Learning”; “Examining Communities and Urban Change”; “Benefits and Educational Outcomes of Internships”; and more than 30 other publications that include research in the area of housing, community building, planning, and neighborhood revitalization. He received his doctorate from the University of Notre Dame after earning a bachelor’s degree from Phillips University and a Master of Divinity from Union Theological Seminary in New York City. Share your event experience using social media. The hashtag for the lecture is #Torstenson.